Want to Understand Web Accessibility? Participate! Why is it important to be able to use a web page without using a computer mouse? How does it work when a web page text is enlarged? How does a screen reader interpret a web page? Get the answers to these questions and learn why and to whom this is important. And why is this a good exercise? Because many who are familiar with accessibility guidelines do not have the insight of why the rules are there. Even though you might at some point have been informed about the impact it has on your work, one might quickly forget to integrate accessibility in one's working procedure. At Siteimprove, accessibility is an integrated part of our work but it is still a good exercise helping the attitude towards the area to have a basic understanding of WHY it is important and not just considered another set of rules one has to comply with. Several computer users cannot use a computer mouse and have to navigate from the keyboard alone. It can be a big problem for them if some elements on a web page can only be accessed with a computer mouse. Some people use screen reader software that renders the web content to the user in one long sequence. The experience can be compared to viewing a page without design (style sheets) for a visual user. Because of this, it's important to screen reader users that content be rendered in a meaningful sequence. Another group often experiencing accessibility issues are the visually impaired, who need to enlarge content on a web page in order to be able to read the text. It is a common problem for these users that elements or text on the webpage disappears or overlaps when the text is enlarged. the Web Content Accessibility Guidelines: All content on a web page must be accessible from the keyboard alone (criterion 2.1.1). The content of a web page must be presented in a meaningful sequence programmatically (criterion 1.3.2) and the size of text can be re-sized and as a minimum be enlarged 200 % (criterion 1.4.4). Many of my colleagues were happy to take up the challenge and considered it to be a great learning experience. Most of them reported that after just 10-20 minutes they were profoundly frustrated about things like reading a web page with text enlarged: "it was simply a pain having to scroll so much just to accomplish any little thing. What a hassle!". Others were frustrated with encountering functionalities on a web page that could not be accessed with the keyboard: "I wish more web editors took on these type of challenges in order to understand how disabled people may experience the web". In general, the feedback was that this type of exercise helps the understanding of the challenges that accessibility problems entail for users: "Seriously though, this is hard and my appreciation for those that are physically impaired has risen tremendously!" So, I would like to encourage everyone who works with web to do the following: Choose one of the criteria in the web accessibility guidelines and simulate a user scenario that enables you to have a better understanding of why accessibility guidelines are important. 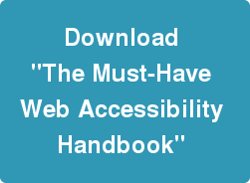 For the ultimate way to get acquainted with web accessibility, download "The Must-Have Accessibility Handbook".